NEW: Download our eBook "Beat the Boards—30 USMLE Step 1 Question Walkthroughs" for FREE! USMLE questions are insanely difficult. To successfully answer them (and pass the exam), you’re going to have to learn to negotiate multi-step thinking. Lecturio’s Qbank Walkthrough is a special tutorial course we’ve created to help you do just that. 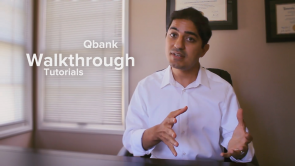 Our Qbank Walkthrough features YouTube star DocOssareh (Mohammad Hajighasemi-Ossareh, MD, MBA), who’ll teach you how to intelligently work your way through whatever type of USMLE question the examiners decide to throw at you on the big day. In particular, DocOssareh will show you the different types of USMLE questions and how to correctly tackle each one in order to give you the best chance of quickly coming to the right answer. DocOssareh believes it’s just as important for you to know why an answer choice was wrong as it is for you to know why it was right. He also believes it’s vital that you spend time reviewing high-yield information relevant to each practiced question (you’ll be glad to know Lecturio has features and tools to make the retrieval of relevant high-yield info a breeze). Test-taking strategies? DocOssareh’s got you covered on those, too. By the time you come to the end of our Qbank Walkthrough tutorial course, you should be in position to wring every last drop of value from any USMLE practice question you select. And come test day, you’ll go in filled with confidence, ready to earn an excellent score. The techniques to tackle questions was explained really well. I really liked the small topic review after every question. yuor information and type to make it, it's so interesting. Well explained, neurological eye problem due to complication of MS. Wonderfully tackled.Absolutely amazing. Can we have similar walk through for pathology? Love the way lecturio presents this question cases and walk the student through them thoughtfully. Love it !! !